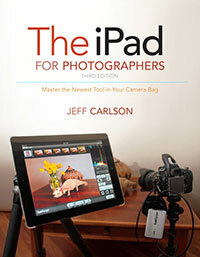 Photographer Ron Martinsen (who I mentioned the other day about working with the Eye-Fi wireless memory card) has written a glowing review of The iPad for Photographers, where he not only expresses his opinion of the book as a whole, but also breaks down his thoughts on a chapter-by-chapter basis, too: Review: The iPad for Photographers — Read This Book! I love Snapseed and its intuitive photo editing tools. It’s the first app I cover in Chapter 5. And this week, it’s Apple’s App of the Week in the iTunes Store, which means it’s free! How does the wireless Eye-Fi memory card handle the load of working with the large image files created by the Nikon D800 and Canon 5D Mark III? Pro photographer Ron Martinsen writes about the results on his blog. I cover the Eye-Fi in some depth in The iPad for Photographers, and also recommend using ShutterSnitch for handling the transfer to the iPad. After a lot of work, Photosmith 2 is now finally available for sale at the App Store! The app costs $19.99, which sounds steep compared to many apps, but is a great deal when you consider that Photosmith is still the only one that lets you rate, tag, and assign other metadata to your photos on the iPad, and then import them all—metadata intact—into Photoshop Lightroom. If you previously owned Photosmith 1.0, the update is free! I’ve mentioned it before: Being able to write about Photosmith 2 (which was in an early pre-alpha stage at the time) greatly improved my book, allowing me to address one of the big holes in iPad photo workflows. I’m happy that pretty much everything in the book is still valid in the shipping version of Photosmith (with the temporary exception of GoFlex Satellite support). The app is great, and Chris, Chris, and Nico (as well as others who are helping them out) have done a great job with it. What are you waiting for? Go download it now! My iPad was my sole computer during a trip to Ireland last month. I truly didn’t miss my laptop at all. iPhoto handled all of my photo-related demands during six days of highly aerobic tourism and conference-going. I culled the one or two dozen good photos out of the one or two hundred photos I shot during each day’s adventures; I edited and enhanced the keepers; I shared a few of the good ones on Twitter and Flickr; and I kept everything organized. By the time I got back home, I already had a nicely edited album of photos to show off to a group of friends who had already been assured via email that they wouldn’t get any of the single pot still whiskey I brought home until the slideshow was over. Compare and contrast this with my photos from my trip to China. I had my MacBook with me and the full editions of Aperture and Photoshop during that trip. It was nearly three years ago and I still have yet to edit and post most of my shots. The developers of Photosmith 2, which I feature heavily in Chapter 3 of the book, can see the light at the end of the tunnel. In a blog post today, they reveal that Photosmith has reached Final Candidate status and will soon be submitted to the App Store. Software development is hard work, and Photosmith is a deep app. So it’s disappointing but not surprising that one cool feature won’t be available at launch: backing up photos to a Seagate GoFlex Satellite drive. The feature works from the Photosmith side (I’ve gotten it to work in an earlier beta), but a bug was discovered in the drive’s firmware that compromised the data integrity—and if a backup isn’t reliable, then it’s not really a backup, is it? It’s a really great feature, and I’m looking forward to Seagate squashing the bug and seeing the feature return to Photosmith. Cool! 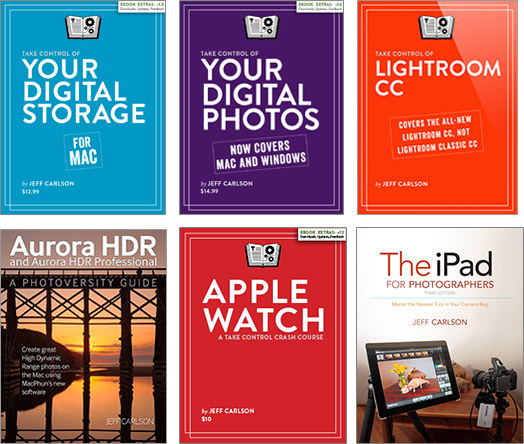 For All Events has named The iPad for Photographers as its book of the month. This week I was happy to be a guest of Chuck Joiner’s MacVoices podcast, where we talked about the iPad and all the uses that photographers can get out of it. Is the iPad now an essential tool for photographers? How can you get photos onto the iPad, and what can you do with them after? I’m probably responsible now for a sudden disappearance of money from Chuck’s bank account as he buys a bunch of new apps for his iPad. Visit the MacVoices.tv site for the video version of the interview. An audio version is available as well. Now this looks interesting: TriggerTrap Mobile is an app for iOS that lets you trigger your camera’s shutter remotely. In the book I talk about DSLR Camera Remote HD, which requires that you tether your DSLR to a computer; the iPad communicates to an application on the computer over Wi-Fi. TriggerTrap takes the computer out of the loop. Using an adapter and a cable (also sold by the company), you can connect the iPad (or iPhone or iPod touch) to the camera and control it there. (Or, just use the software to control the camera in the iOS device.) TriggerTrap Mobile offers a bunch of options for firing the shutter, too: The GPS capabilities of a cellular iPad enable you to specify that a shot is taken based on distance, such as every 100 meters. Or, use facial recognition, motion detection, sound detection, timelapse, and other methods—12 in all for the paid version ($9.99), 3 for the free version. TriggerTrap Mobile looks pretty snazzy, and I’m looking forward to playing with it.